See more pictures of the Tangerine Top here. Any frustration from various set backs in this project have faded. I can now happily chat about its various details and new-to-me techniques. I've already discussed using the serger to cut out pattern pieces. The big new-to-me technique was the mock cover stitch hem. My only previous experience with a hem on a sweater knit was with the Turtle Beach sweater, where I used elastic lace of a coordinating color as hem facing and stitched the hem by hand. 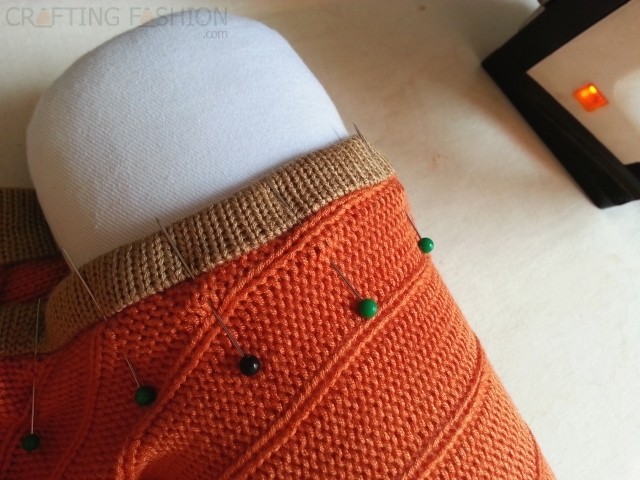 Using a hem facing is highly recommended with medium to heavyweight knits. Otherwise it's very likely that there will be a ridge where the hem is sewn, due to the thickness of the fabric. 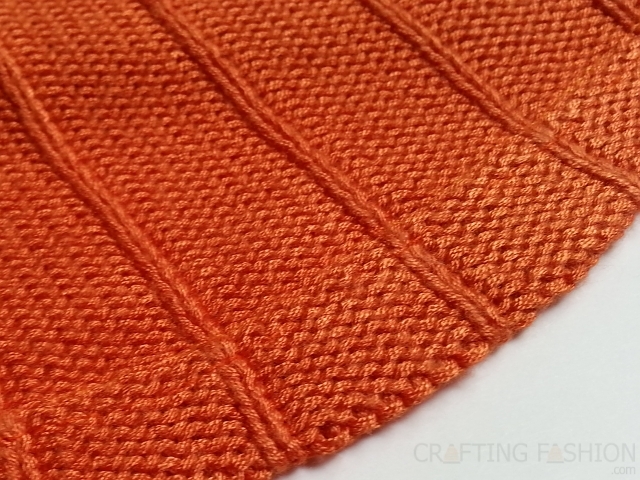 Since the Tangerine Top was going to be on the casual/sporty side, and since I actually wanted to emphasize the asymmetrical hemline, I decided it was the perfect time to give a mock cover stitch, without facing, a go. 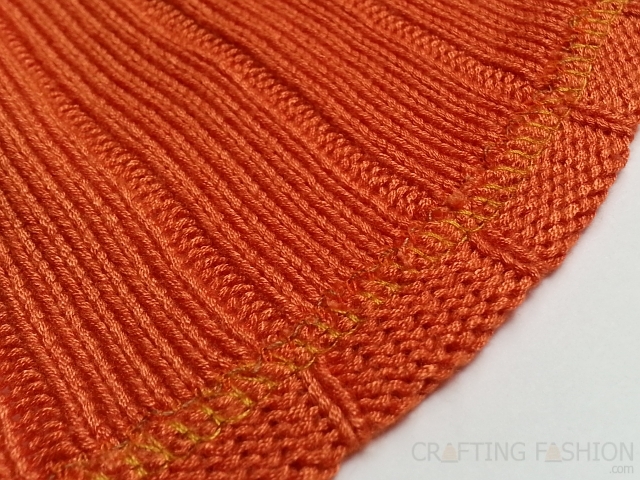 (A mock cover stitch is when you don't have a cover stitch machine and decide to fake it with a twin needle.) I didn't look at any tutorials before I tried it, since the process seemed pretty straight forward to me. I've since discovered that some folks online warn of "tunneling" between the needles. I'm not sure what the exact definition of tunneling is, but here are close-ups of how mine turned out. This is the public side. My preparation was to mark the asymmetrical hemline I wanted with an air erasable pen and serge the edge. I then steamed the hem and used fabric glue stick to hold the hem in place. On the right side I sewed the hem with a twin ballpoint needle. You can see the finished top in my previous post. 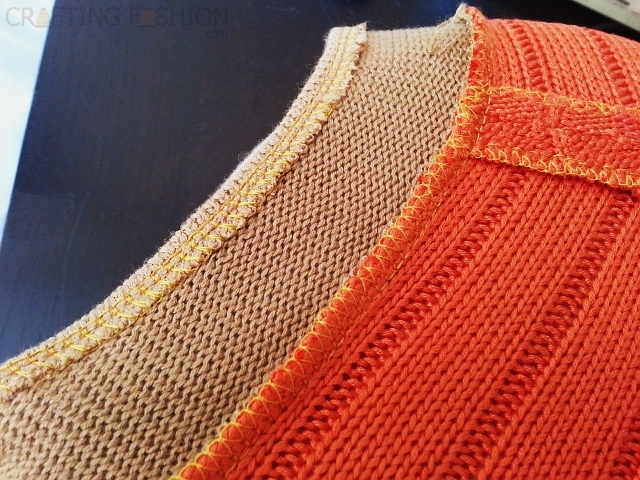 Though some may avoid finishing the edges of lighter weight knits, the edge of a cut sweater knit fabric must always be finished to prevent runs and fraying. I'm happy with either bands or binding. I chose a contrasting binding for this top. Binding in progress, this is the inside. Fold, pin, steam and top stitch (not shown) - this is the public side. I have a few more notes on the techniques used for this top, which I'll share at another time.